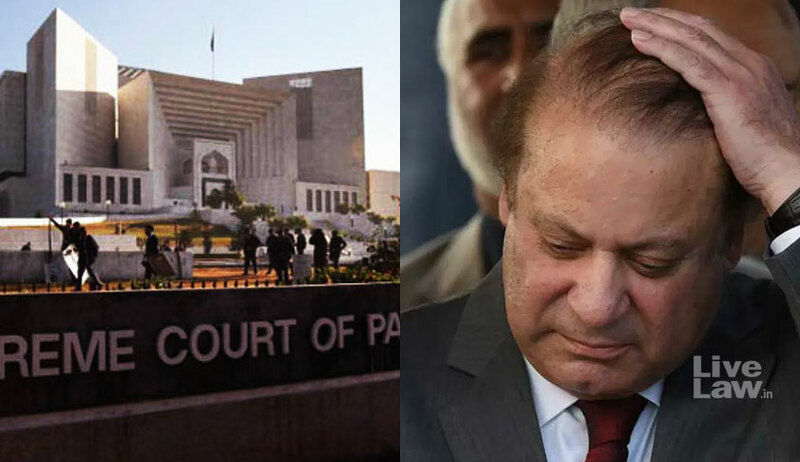 The Supreme Court of Pakistan, on Friday, disqualified Pakistan’s Prime Minister Nawaz Sharif, directing the National Accountability Bureau (NAB) to prepare and file a reference within six weeks against Nawaz Sharif, Maryam Nawaz Sharif, Hussain Nawaz Sharif, Hassan Nawaz Sharif and Capt (Retd) Muhammed Safdar and others. The five-Judge Bench comprised of Justice Ejaz Afzal Khan, Justice Gulzar Ahmed, Justice Asif Saeed Khan Khosa, Justice Sh. Azmat Saeed and Justice Ijaz Ul Ahsan. “It is hereby declared that having failed to disclose his un-withdrawn receivables constituting assets from Capital FZE Jebel Ali, UAE in his nomination papers filed for the General Elections held in 2013 in terms of Section 12(2)(f) of the Representation of the People Act, 1976 (ROPA), and having furnished a false declaration under solemn affirmation respondent No. 1 Mian Muhammad Nawaz Sharif is not honest in terms of Section 99(f) of ROPA and Article 62(1)(f) of the Constitution of the Islamic Republic of Pakistan, 1973 and therefore he is disqualified to be a Member of the Majlis-e-Shoora (Parliament),” the Bench ruled, directing the Election Commission of Pakistan to immediately issue a notification disqualifying Mr. Sharif from being a Member of the Majlis-e-Shoora (Parliament). “The President of the Islamic Republic of Pakistan is required to take all necessary steps under the Constitution to ensure continuation of the democratic process,” it, thereafter, observed. The Court further requested the Chief Justice of Pakistan to nominate a Judge to supervise and monitor implementation of the judgment “in letter and spirit”, and oversee the proceedings conducted by the NAB and the Accountability Court. The main question posed before the Court was whether Mr. Sharif, who was the Chairman of a company called Capital FZE, was required to disclose his salary received in that capacity while filing his nomination papers. Representing Mr. Sharif, Khawaja Harris Ahmed stated that Mr. Sharif never withdrew a salary despite being on the Board of the company. The Court, however, concluded that “a salary not withdrawn would nevertheless be receivable and as such would constitute an asset for all legal and practical purposes”. It then ruled that Mr. Sharif’s failure to disclose the fact amounted to a violation of Section 12(2) of the Representation of the People Act. “Where respondent No. 1 did not disclose his aforesaid assets, it would amount to furnishing a false declaration on solemn affirmation in violation of the law mentioned above, therefore, he is not honest in terms of Section 99(1)(f) of the ROPA and Article 62(1)(f) of the Constitution of the Islamic Republic of Pakistan,” the Court, thereafter, held. The verdict is being viewed as the most serious ramification yet of the Panama Papers leak, which detailed financial dealings of the Panamanian law firm Mossack Fonseca. The papers had linked Mr. Sharif’s children to the purchase of London property through offshore companies in the British Virgin Islands in the early 1990s. At that time, the children were minors, and therefore, the purchase is assumed to have been made by Mr. Sharif himself.